Ever since the demise of Windows Mobile, Microsoft has been working hard on porting its existing apps as well as creating new ones for both Android and iOS. The company has already launched a couple of apps such as SMS Organizer, Edge Browser, Microsoft Office and more, that are doing quite well on both the platforms. As such, the company’s CEO, Satya Nadella made sure to reflect upon the success of its team at the company’s recent event. Every year, Microsoft hosts its Inspire conference, which is basically a showcase platform for the company’s plans for software for its partners. 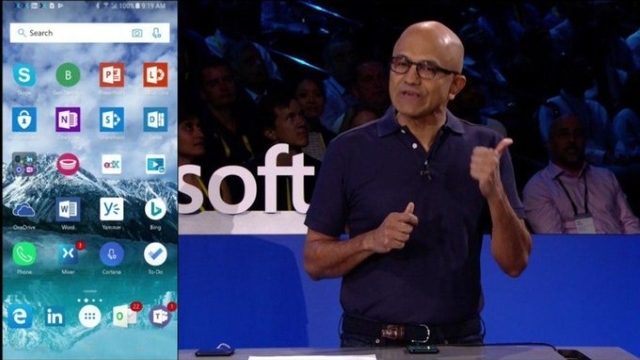 Last week, during the latest Inspire conference, Microsoft’s CEO Satya Nadella took the stage to display the company’s apps running on both iOS and Android devices. According to Nadella, quite a heavy number of Windows Mobile users had switched to Android, thanks to its versatility, alongside Microsoft application support on the Play Store. He also referred to both platforms as an “Endpoint for Microsoft 365” and also showcased default environments where the user can switch the stock offering for the Microsoft’s applications. Alongside the aforementioned apps, Microsoft also has a couple of more apps under its name, such as the Microsoft Launcher, Outlook, Teams, LinkedIn, and Yammer, that have been doing really well on both Android and iOS. Additionally, the company had recently also partnered with Samsung, which now ships its smartphones with a whole package of Microsoft apps pre-installed on them. With reports of Microsoft scrapping its plans for their own new mobile device, it makes all the more sense for the company to keep its focus on its Android and iOS apps.